Time Saving Solutions for Excel (Excel Utility) provides a wide range of Excel productivity tools ad solutions under different categories such as Excel compare, automatic report generator, counting solutions, password recovery, download stock prices and more. 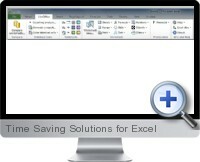 Time Saving Solutions for Excel supports Excel 2010, 2007 and 2003 and installs as an Excel add-in to provide a complete set of efficient productivity tools from the menu bar. Compare worksheets - logical and visual comparison between two worksheets. Counting analysis - information about the number of unique values in a selection. Generate a report - generates a summary report using VLOOKUP, COUNTIF and SUMIF functions. Fill color in cells with same value - highlights identical cells in a selection. Fill color in cells with same value as active cell - highlights all cells that have same value as active cell. Filter on the fly - quick filters like not equal, greater/less than active cell and more. Header formula SUM or COUNT - adds a dynamic formula that sums or counts the data below a cell. Header style - design a header and to apply it to the first row in the worksheet in one click. Filter active cell - filter the table on the value of the active cell. Worksheet view - design a worksheet and apply the style in one click. Convert to values - convert cells in a selection to hard values or with VALUE function. Formula error masking - wraps ISERROR formula on each cell in a selection. Fill color in each n'th row in selection - fill every n'th row in a selected range with a specified color. Create an index page with links to all sheets - creates a new worksheet with hyperlinks to all worksheets in the workbook. Remove all empty worksheets - deletes all worksheets that do not contain any data, formatting or objects. Hide/Unhide Sheets Control - hide or unhide all sheets at once. Remove unused empty ending rows and columns - remove all unused rows and columns at the right and bottom of a data range. Count number of characters in active cell - utilizes the LEN function on selected cells. Remove unnecessary spaces - utilizes the TRIM function on selected cells. Reverse text in selected cells - reverses the text character order in each cell. Extract text - extracts text only in each cell in a selection. Extract Numbers - extracts numbers only in each cell in a selection. Change values to text - adds an apostrophe before cell cell value in a selection. Add character before and after a value - extracts text only in each cell in a selection. Rounding numbers - rounds selected cells to a specified number of digits. Convert numbers to words - convert the numbers in a selection to English words. Customize number style - set four different formats to execute in one click. Accounting style - formats numbers in standard accounting format. Global date style - formats dates as dd-mmm-yy to for global compatibility. Style 1 and 2 - define two custom styles to apply in one click. Define a dynamic range - four types of ranges: expand down to the last entry, expand down as many rows as there are entries, expand right to the last entry, expand down and right as many rows as there are entries. Delete range names - delete all range names in the workbook or active worksheet. Remove empty rows in selection - remove all rows without data in a selection. Delete duplicate cells in selection - delete all cells that are exactly identical to other cells in a selection. Remove identical rows - remove all rows that are exactly identical to other rows in a selection. Remove hyperlinks, pictures and shapes - choose to remove selected objects within the worksheet. Activate hyperlinks - activates hyperlinks to be clickable in a selection. Stock historical prices - get historical prices for stocks by symbols in a selection. Stock online price - get stock details directly to a new worksheet by symbols in a selection. Print multiple sheets at once - choose which sheets to print or quickly select all. Insert details to the footer right page - insert name, date and time to the right footer of the printed area. Empty all details in header and footer - empties all details in header and footer. Copy selection as JPG - copy a selection to the clipboard as a JPG format. Password recovery - removes password of protected worksheets and files.